Confessions of a Greenpeace Dropout: The Making of a Sensible Environmentalist is Dr. Patrick Moore’s engaging firsthand account of his many years spent as the ultimate Greenpeace insider, a co-founder and leader in the organization’s top committee. In Confessions Moore persuasively argues for us to rethink our conventional wisdom about environment and, in so doing, provides the reader with new ways in which to see the world. Sowell shows how intellectuals have filtered information in the media, in the schools, and in academia, to leave out things that threaten their vision of the world. Intellectuals’ downplaying of objective reality and objective criteria, says Sowell, extends beyond social, scientific, or economic phenomena into art, music, and philosophy. Above all, he reveals how intellectuals exalt themselves by running America down and turning Americans against each other. Whether the subject is crime, economics, or other matters, intellectuals hold positions that are conspicuously different from those held by society — while presenting themselves as intellectually and morally superior to ordinary folk. Thomas Sowell talks about this book in this interview. Maritimers who have been conditioned to think that the east coast of Canada is one of the most liveable regions in the country. Author Peter Moreira, a native Maritimer who returned home after working overseas for more than a decade, offers a straightforward analysis of why the region has fallen so far behind the rest of the country in terms of most economic and social indicators. Backwater is not an attack on the place we call home, but rather a wide-ranging and timely examination of the region’s flawed policies and thinking. 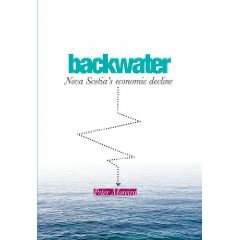 The book makes bold recommendations for fixing the Maritimes’ current problems, citing many leading professionals and politicians in the region, including Nova Scotia premier Darrell Dexter. Peter Moreira has worked as a journalist in Halifax, Ottawa, Hong Kong, Seoul, and London for such news organizations as Bloomberg News, the South China Morning Post, and the Canadian Press. He is now a correspondent and editor for The Deal, a New York-based corporate finance publication. He is also the author of Hemingway on the China Front (Potomac Books 2006). Peter lives in St. Margaret’s Bay, Nova Scotia, with his wife, Carol, and children, Cat and Scott. Yeah … we’ve largely given up yelling too. Sympathize. Unfortunately, my wonky knee limited my ability to track down the source — but my bet is that was dumped from some septic system upstream of any Acadia University infrastructure. I too have wondered why the Stirling engine has never “taken off”… and I know at least 1 Acadia Prof who shares that sentiment. I take it you would be referring to a solar-powered Stirling engine? The best place to develop that sort of technology would be in Australia — where the weather conditions are more appropriate for the technology than in NS. But the technological challenges are not insignificant and require considerable intellectual effort. Just the other day the stream in question was filled with something that looked like sewage, or a giant aglae bloom let loose; the comment above refers to something I tracked directly to Acadia. If you want to get in touch with me to tell me more about the location of the stream feel free; I would gladly explore further up and document what I find. Sterling Engines can use any heat source, so if placed over a large pit filled with biological waste like compost and pooh; the heat generated from that will fuel the Sterling Engine. Or placing it near a parabolic mirror/giant glass lens to focus the sun light onto the engine works well from what I have read. All the other alternative energy giant machines and turbines and over complicated neo-nuclear solutions are too complex and silly; monstrous and encumbered with design flaws; the solution lies in simplicity. Hey there. Would love to put a video like this one on a site I am developing, annapolisvalleynews.com.. My only issue is the cursing. If you were able to beep out the swearing I would love to put it, as well as a bit of a write up on the site..
We want to point out that the videos (and the cursing) are not ours. The link to the videos is put up by the commenter, Stephen, so if you wish to use it you will have to contact him. Maybe that language will get some action. I doubt it.